Fat is the most concentrated source of energy, which is why you might get a boost from eating sugar. On a LCHF diet (or low carb ketogenic diet), fat is your FUEL. Your body and brain actually run much better on Healthy Fats than they do on carbs & sugar – with a lot less “crashing”, and a lot less health risks! As you know, on a low carb diet we also track Fiber. Most people subtract Fiber from Total Carbs to get Net Carbs, with a limit of 20 net carbs per day max. I use MyFitnessPal, which is a FREE Macro Calculator and a great way to keep up with your progress. It also allows you track exercise and calories burned, water intake, and determine accurate nutrition facts for your recipes. See: How To Track Net Carbs In MyFitnessPal and also watch this video tutorial. To give an example, I am eating my breakfast as I write this. 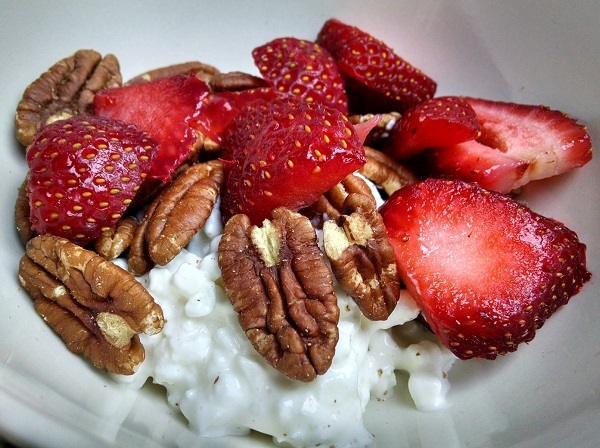 It’s 1/4 cup Daisy Brand Cottage Cheese, 1/3 cup pecan halves and 2 medium strawberries. A healthy low carb diet is approximately 75% fat, 20% protein, 5% carbs. As you can see, this meal fits that criteria very well. The percentages are over your total daily calories, so you can tweak your meals as you go to meet your goals. It’s very important to track properly. Eating “too lean” can stall your weight loss and tank your energy. Without tracking, there’s no real way to know how many carbs you’re actually consuming. And there’s no nutrition data or food diary to refer back to if you experience health issues or a weight loss stall. By tracking, you can easily identify what may be causing certain issues. It also helps A LOT if you ask someone for help, if you have actual data for them to go over with you. Don’t over-complicate it though, or let it become a total obsession. 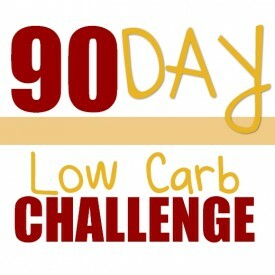 Just eat 20 net carbs a day max, and get 70% in healthy fats minimum. 20 net carbs, 70% in fats. My advice is to eat as much “real food” as possible. The less processed food the better, and the less complicated your recipes the better too. A good rule of thumb is: Meat & Greens + Healthy Fats. Unless you’re vegetarian of course, in which case you’ll get your protein from other sources. This becomes a HOT debate across low carb groups & forums: high protein vs high fat. I encourage you to do your own research on that. A high protein diet over an extended period of time can cause serious health issues, most commonly: kidney function. I’ve seen this over and over. Don’t make that mistake. Here’s the thing: While I don’t focus on protein as one of my macronutrients, I get plenty of protein in my diet. More than the recommended amount, even. Protein does not help you build muscle or make you stronger, by the way. You will NATURALLY get enough protein on a LCHF Diet. Even though the focus is on eating healthy fats, and using fat as your source of energy (instead of carbs), you’ll still get plenty of protein in your diet. I’ve heard people say that you need 100 or 150 grams of protein a day. I’ve also heard people say you should drink half your body weight in water, which is NOT TRUE lol. On that note, don’t try to go by grams. Just get 20 net carbs a day or less, and at least 70% of your calories in healthy fats. Period. Analyzing grams gets really confusing, because many LCHF foods are both healthy proteins AND healthy fats – like eggs and salmon, for example. So when it comes to tracking your macronutrients, go by ratios only. As you can see, that is: 78% Fat, 19% Protein, 3% Carbs. What you don’t see… is that I consumed 116 grams of Protein that day. MyFitnessPal gives you tons of data to work with, and that’s a GREAT thing! But it doesn’t mean you have to pay attention to all of it -lol. In fact, just ignore half of what she says. I swear, half the time I think that lady needs Prozac. 😛 haha. MFP is set up for low fat / low calorie diets, so half the data won’t be relevant to you anyway. Just ignore it. Don’t sweat it too much in the beginning through. Just track 20 net carbs or less, 70% in healthy fats (minimum). That’s it. You’ll naturally start making better/smarter food choices as you go… because reading labels is VERY eye opening! So like I said, don’t over-complicate it, and don’t give in to the “food bullies”. Just track net carbs and healthy fats, and learn as you go. p.s. If you have questions about tracking, protein or fat – leave a comment! 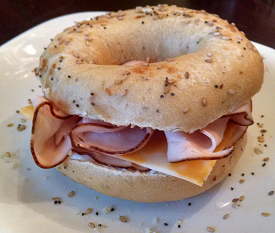 There are many healthy foods that are great sources of both protein AND fat. Some of my favorite “real foods” that are part of my regular “low carb staples” include: pecans, walnuts, Daisy Brand cottage cheese (because it only has 3 REAL ingredients! ), avocado, salmon, tuna, ribeye steak, strawberries, spinach, yellow squash fried in olive oil, avocado pecan chicken salad, and I love “loaded broccoli” (steamed broccoli topped with butter, sour cream & cheese). YUM! ← Are you UNSTOPPABLE? Show It Off! Do you need to count calories also? I’ve tried so many diets and change the way I eat many times and can’t seem to shred these dreaded last 15 pounds. I workout 6 days a week, drink a ton of water and eat good but the scale stays the same.. However I am losing inches and I can’t possible lose any more in my waist. I feel pear shaped.. Chest 36, arms 11.5, waist 24, hips 37, thigh 22. Someday I just want to scream and throw that forbidden scale out the damn window..any suggestions? I don’t count calories, but if you’re eating a low carb ketogenic diet your calories are typically in the lower range anyway – as it’s a natural appetite suppressant. Sometimes mine go as high as 2000 but more often than not they’re closer to around 1200. And I lose either way. A few years ago I went on a low carb diet and lost approximately 40 pounds. The pounds have all come back, plus some. I saw your blow and started following it and low carbing again. Within two weeks I lost twelve pounds. Now, I have not lost a single pound in over two weeks. Any suggestions? So I’m confused, if you dont track calories how do you make sure you get close to your macros?? 25% of 1200 calories is going to be different than 1800 calories. How do you know roughly how much to eat?? I only eat when I’m hungry, and I don’t eat when I’m not – or I stop when I feel satisfied. I’ve figured out over time about how much I can eat at once, especially with less appetite when you’re eating a ketogenic low carb diet, but that often means I make two meals out of one. If you track as you go throughout the day, you can easily see if you need to include a healthy fat with your last meal (avocado, salmon, cheese, cream, macadamia nuts or pecans, an egg salad on the side, etc). It’s easier than it sounds. Just put your foods in before you make/eat them and you can see how it works out. Every meal doesn’t have to be 70% fat or 25% protein, it just has to equal out that way at the end of the day. You can see my own food diary posts here on the blog for examples of that. Anglea – were you asking about grams or about portion sizes? If portion sizes: only eat when you’re hungry and stop when you’re satisfied. If grams – that’s the reason I don’t go by grams, but rather percentages or ratios. I’m a vegan trying to do a ketogenic diet and it is very hard to go below 20 net grams a day because alot of vegan protein substitutes have carbs. I do 50 net carbs a day…will that still bring me into ketosis? You’ll just have to test it and see. They make strips & sticks you can use to test for ketosis. I don’t use those, but you may want to. Do you eat things like cheese and cottage cheese, or nuts? Pardon the ignorance, I’m not up to speed on the different levels of vegan diets. I’m happy to help though! What kind of protein substitutes do you use? Thank you for this! Do you pay for a subscription to myfitnesspal to track your fiber? It seems that is the only way to adjust my goals to track it. Is that true? No, I don’t use the paid premium version. 🙂 I only use this hack: http://www.travelinglowcarb.com/4448/myfitnesspal-hack/ Note: It only works online (not on the mobile app), and you have to set it up in Firefox or Chrome. How do you get myfitness app to show net carbs like yours do? I read that too much protein (macros) will actually convert it into carbs. Sometimes, I want to eat salmon, but can’t if I ate too much protein that day. You’ll read all sorts of stuff online. 🙂 I’ve read too much protein turns to glucose (sugar, which is carbs). The real thing you want to watch out for is eating high protein for an extended period of time – and the effect it may have on your kidneys. I’m not a doctor (obviously, lol) but I recommend you do some research on that – and anything else you “hear”. Is there a way to do this on explorer? I don’t know where to find the ‘pie chart’ on MFP. If you’re online, it’s at the bottom left of the page below your Food Diary (where you enter your meals). If you’re on the app, click Nutrition – then click the graph icon at the top right to switch to the graph instead of the list. Thank you so much for all this wonderful. It is helping me tremendously. I choose foods naturally high fat. If you look at my daily food journals, and the macros I post with the meals: http://www.travelinglowcarb.com/category/low-carb-daily-journals/ you’ll see how easy it is. Sausage & eggs is great. Chicken thighs are better than breasts (skin on – they crisp up so nice in the oven!). They’re cheaper too. 😉 Ground beef is a good fatty meat (even Ground Chuck) so taco salad, hamburger steak, etc. Cheese, sour cream, smoked sausages (great w/Kraut), and I love cucumber salad or egg salad – made with real mayo, preferably Duke’s Mayo, but any real mayo is a good fat. 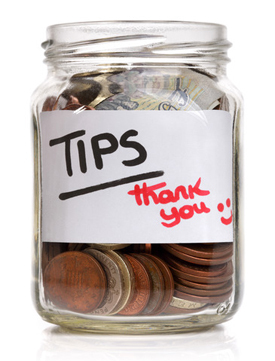 Hi Lynn, I just wanted to thank you for all the great information you post on here. It has been such a huge help to me. I have lost 28 lbs since new years day!!! More importantly my husbands cholesterol has been cut in half. We had been doing what the Dr. said for 2+ years and nothing was happening. When he went last month it had dropped for the 1st time from 308 to 160 (Triglycerides), still high but a HUGH improvement in just over 4 months!! Everything in his blood work had improved, but that’s always been the biggie that we were concerned about. I love that your meals are so simple and easy to prepare. I cook daily but it is just one more on my list of chores, not something I love to do. I am also a Tennessee girl so I was excited to see that we had that in common. I use your blog and Butter Makes Your Pants Fall Off for most of my info (he’s also from Tn.). Anyway, Thank you for all the help!! Congratulations to you both, Christy – that’s awesome! 🙂 Kudos for taking control of your health, together, and seeing such great results!! I have downloaded Firefox but noticed when you show what you have eaten, below everything it shows a percentage in green. Is that how it should look when I enter info in myfitnesspal? I put fiber in my tracking on MFP, but it doesn’t show net carbs. Did I miss a step? It show the fiber, and carbs, but not net carbs. See: http://www.travelinglowcarb.com/4448/myfitnesspal-hack/ Did you do the last step, activate it? Try that! Restart your browser after too and see if that helps. It only works online by the way, not on the mobile app or tablet. Lynn….how do you test for ketosis if not with the strips? Blood? Did you buy a glucose testing machine or something? Hi Sydney! I don’t test. I can tell by the way my body feels if I’m in ketosis or not. I have a very lean feeling in ketosis. I plump up with water weight immediately (even a pound is very noticeable) if I knock myself out of ketosis. Or I know for sure if I eat something off plan 😛 haha. Sometimes it surprises me until keto flu hits me 3 days later – then I know I WAS out. 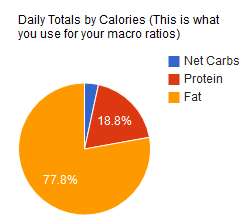 Can you tell me how to get the Macronutrient Pie Graph up on MyFitnessPal page? I have filled in all the numbers and my percentages are the same as yours, Lynn, but no round pie chart appears with the percentages. Frustrated! Awesome, Carmen – and good to know, because I use my Macbook on the go. 🙂 Thank you!! Thanks for all your explanation posts on the micronutrients and percentages. That’s correct, Carmen. 🙂 The key is to keep it simple: 20 net carbs max, 70% fat minimum. Everything else should work itself out fine if you just focus on that only. Ignore goals, calories, grams, etc. Hi Lynn! I’ve been doing this for five weeks now and have lost 18lbs so far. A few weeks ago I had an insane amount of energy and was bouncing off the walls at times. But within the last week my energy has started to decline and I have not cheated at all. According to MFP I’m staying really close to 20/70 bit I’m starting to wonder if I need more fats to get that energy back or has my body now adjusted and that stage over? Also I was wondering why so many people are having trouble getting their fats in and doing fat bombs to help. I struggle to keep mine between the 70-85 range daily and most days I’m still hungry. Any suggestions? My advice: Go back to your food diaries and see if there is anything new or different. Did you change anything, start/stop anything? If so, go back to what was working better for you – and resulted in more energy. If everything is exactly the same, increase healthy fats. You shouldn’t be hungry! Are you also eating low calorie? Good sources of healthy fats that are also super foods and very nutritious include pecans & walnuts, salmon, tuna & avocado. Thank you for replying Lynn! With the fats I struggle to keep mine between 75 to 80. Sometimes they are doubled what they should be. I do the BPC in the morning (2 cups with a table spoof of butter & coconut oil and about three tablespoons of HWC. That is all I’ve been doing for breakfast. Then lunch is usually a subway steak salad with ranch and dinner usually a meat, fat and green veggie. I snack on pecans. I’m not doing low calorie. You’re going by percentages – not grams – right? So 70-80% fat and keeping your protein at 25% or less? Are you still feeling hungry and low energy? If so, at what time of day does that usually hit you? Thank you in advance, Alesha. What food are healthy fats and how do you count them to ensure 70%? Hi Leann 🙂 See: http://www.travelinglowcarb.com/4393/healthy-fats-and-super-foods/ Healthy fats are pecans, walnuts, avocado, salmon, real butter, olive oil, just to name a few. Where do I get the My Fitness Pal Macro Calculator? So I understand keeping the net carbs below 20 and I try to stay within my protein limit. But what about fat? Do I need to stay within my fat limit? I’m using cronometer to track macros and wondering if I go over the fat limit, will I not lose weight? Will i burn the fat I’ve eaten that day instead of stored fat/excess weight?? Do I need to limit fat? I’m confused. You want to keep it simple: 20 net carbs max, 70% fat minimum. The protein should be 25% max, but that usually takes care of itself easily if you are doing 70% fat minimum. It IS just a minimum – I often do 80% fat or more. And the more healthy fats you include the better your weight loss & energy. 😉 So no, you do not need to limit fat. The ideal kinds of fats to consume are: salmon, ribeye, avocado, pecans (and other nuts), real butter, coconut oil, olive oil, heavy cream, real cheese. Eggs are a good healthy fat (about 50/50 protein/fat) so cheesy eggs scrambled in real butter are great for example. Avocado is great salted & fried in butter too! Hi any idea from where can I download an excel version of nutrional value of foods. Been searching high and low for sometime but cant find. The closest thing I know of is here: https://ndb.nal.usda.gov/ndb/nutrients/index but you can only choose 3 nutrients (such as: calories, carbs, fiber – or protein, carbs, fiber). Then you can download the entire food list (if you leave the categories blank) as a CSV file. I’m wondering if the sticks say I’m in ketosis, dies that mean I’m losing weight? Or not necessarily?? By sticks I mean the test sticks. Not necessarily. Weight loss is not linear, it will have dips then holds, even when you are in ketosis. So how do I know if this is working for me? I have lost weight but not sure the exact amount because I can’t bare to get on the scale yet. The sticks say I am in ketosis so do I just keep doing what I’ve been doing?? Not overnight of course, but you want natural weight loss. Not super fast – which results in hair loss, sagging skin, etc. So just keep doing what’s working and enjoy the results! You say to do 20 carbs or less and 70 percent fat to make it dimple. 70% of what? I just dont understand the macros. Is the 70 percent of total calories? So i have to track my calories? So confused, ive been eating low carb but not losing. I use MyFitnessPal to track my macros: carbs, fiber, fat, protein, etc – as explained in this post. While I don’t count calories, that is what you base your fat/protein percentages on. So you want to do 70% fat minimum, 25% protein max. This is how I have my MyFitnessPal account set up to track it, and show me a graph with my ratios/percentages: http://www.travelinglowcarb.com/4448/myfitnesspal-hack/ It’s really easy once you get the hang of it! For the past few weeks I haven’t lost any weight. I’m in ketosis according to my urine strips and I’m under 20 net carbs daily. I try to eat plenty of healthy fat. I have a lot of weight to lose, so I’m wondering if I’m missing something. What do you think I’m doing wrong? I’ve been low carb for about 2 months and lost some weight at first but not lately. Help!! How are you tracking? Are you consistently doing at least 70% fat or more every day? If not, that’s where I would start. Check these 4 points too: http://www.travelinglowcarb.com/5093/not-losing-weight-eating-low-carb/ and let me know if anything stands out to you. 😉 Happy to help! I was using cronometer but have been winging lately. I figured if I was in ketosis, I didn’t have to use it every day. Also, cream cheese and cheese are on the list of culprits. I do eat those. I’m going to try the app that was suggested and cut out most cheese and cream cheese. Hopefully that’ll do it. How do you make sure you get 70% fat if you can’t use the tracker you refer to? There are a number of apps and online trackers. Is there a reason you can’t use any of those?